WhenToWork allows you to view your schedule in Outlook by two different methods. The preferred method is to Export to Google Calendar and then sync Google with your Outlook. This export will automatically be updated when your schedule changes, so you just export once and set up your sync so your Outlook will always reflect your most up to date schedule. 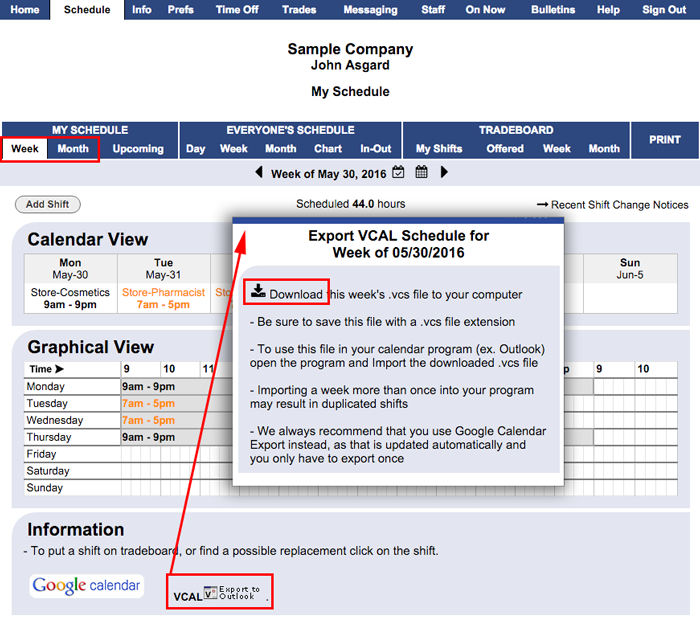 You may also manually download a VCAL file for each of your weekly or monthly schedules. This file format is used by Outlook and many other calendar programs. Note that this is not updated automatically. You would need to download and import the file each week or if your schedule changes. The link to each week or month's VCAL file is on your MY SCHEDULE pages. Click the "VCAL" link in the upper right corner of your schedule page. When you click the "Click here to download" button, do not OPEN the file but choose the SAVE option instead to save the file on your computer. Then start Outlook and choose the IMPORT option (do not use the OPEN option) and choose the file you saved as the file to import. This will bring in the entire week of shift information. NOTE: Importing a week or month more than once into your program may result in duplicated shifts.